Open the Sidebar Menu and select the floor you would like to edit. Select the 'Edit' button from the top toolbar. 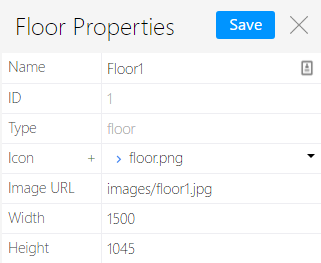 In the resulting 'Floor Properties' panel, edit the Floor Name, Icon, Image URL or floor size (although the floorplan image will change, the position of any desks or staff panels on that floor will not. An administrator may need to re-position these elements of the floor if the image is changed). Select the 'Save' button to confirm your changes.